Is the keto diet bad for you? The keto diet is a food plan created for people with epilepsy to reduce seizures. Why would you want to try a diet created to treat a disease? Because the keto diet can help you lose weight. People are always looking for the silver bullet to get them beach body perfect (there is a whole diet called Beach Body). Many of you who have spent time reading Snack Girl over the years have been exposed to my thinking about different types of plans such as the Whole 30. I have talked about the best and worst diet plans in an attempt to shed some light on a crazy industry. Keto is an industry with many promoters such as Kourtney Kardashian and a slew of health and fitness gurus with best selling books. Everyone who wants to can write a book about keto because it isn’t a copyrighted work. It was created to be shared with the world as a way to help patients with epilepsy. The keto diet aims to force your body into using a different type of fuel to sustain itself. Instead of relying on sugar, the keto diet relies on ketone bodies, a type of fuel that the liver produces from stored fat. It requires that you deprive yourself of carbohydrates, fewer than 20 to 50 grams of carbs per day (keep in mind that a medium-sized banana has about 27 grams of carbs). It typically takes a few days to reach a state of ketosis. Eating too much protein can interfere with ketosis. Nothing new here in my opinion about how the body will respond to a dearth of carbohydrates. This looks like a modified Atkins, Zone, or any other of the low carb, high protein diets out there. Of course, the big modification is adding 75% of your daily calories in fat. 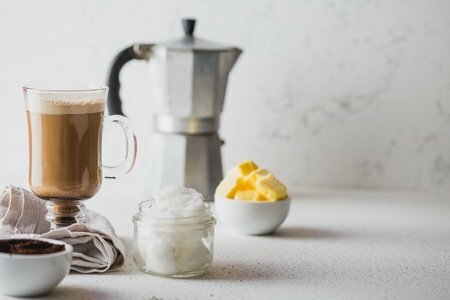 The photo at the top of the page is of the keto coffee or bulletproof coffee that includes butter or coconut oil to help you increase the amount of fat you are consuming in your day. I can tell you that when I first read that about keto, I was seriously concerned about the health effects of the diet because it promotes a large amount of saturated fat. Most (and I say most) of the research has lead nutrition experts to recommend limiting saturated fat to under 10% of calories a day Harvard Medical School - The Truth About Fats. The American Heart Association states: Decades of sound science has proven that saturated fat can raise your “bad” cholesterol and put you at higher risk for heart disease. The books on keto have recipes including bacon, high fat cheese, beef, pork shoulder, and other foods that are soaked in saturated fat. They also have recipes including unsaturated fats such as avocados, olive oil, and nuts. I do think that recommending a diet that is high in saturated fat for a healthy person is wrong. You might solve your weight problem but end up having a heart problem. How is that a good plan? What I know about diets that promote a form of deprivation is that you can’t change just one thing. When you do something as dramatic as decrease your carbohydrate intake and increase your fat intake - your body will react and sometimes not positively. Side effects of the keto diet include headaches, irritability, and constipation. One real issue is that if you are not following the advice of a licensed professional - you might be creating nutrient deficiencies because you excluded whole grains from your diet. Is the keto diet bad for you? YES! At this point there have been no long term studies on the diet to understand its effect on your body over the years. For a short period of time, it is probably fine but I wouldn't recommend it. Why? You are on a restricted diet that may create a nutrient deficiency. Do I think as a nation we eat too many carbs? Absolutely!! My advice would be to start by reducing the amount (or eliminated it for a time) of added sugar in your diet. No cookies, candy, baked goods, soda, or sugary cereals, Then, stick to only whole grains (no white bread or white rice) and see if that changes things. Eat healthy fats in moderation and don't stop eating fruits, vegetables, lean meats, or whole grains. What do you think of the keto diet? Have you tried it? What are the Best and Worst Diet Plans? Every year, US News & World Reports comes out with their list of best and worst diet plans. The keto and low carb diet is good for me. I have diabetes and I do it to keep my blood sugars under control as do other diabetics. Its being proved more and more that fat isn't the problem. In my opinion its the low fat rubbish we have been eating for years that is to blame for the diabetic epidemic. We all eat low fat yogurts, etc, all fat taken out and more sugar put it. Our pancreas has to work harder because of this and its gets worn out. Thats my opinion and no-one is going to change that for me. Sorry if you dont agree with that but we can't all think the same. I have been on the keto diet for over a year and I have lost over 50 lbs. My health has improved including lowering my cholesterol by eating fat. Who would have guessed eating more fat would lower my cholesterol. I had horrible IBS before keto and now I am free of pain and running to the bathroom constantly. And I have actually had fewer headaches than before keto. I think before you say keto is bad for you you should do some more research on the health benefits. Is keto right for everyone? No, but that does not make it bad. My husband and I are medically trained and keto goes against everything we have been taught...BUT what we have been taught is based on a study that wasn’t accurate depicted by Keyes who said that fat, not sugar was to blame for heart disease. We have been eating the keto lifestyle for over a year and all our bloodwork has improved eating 75% fat. My husbands triglycerides are under 100 and my HDL tripled! My husband had the beginning of fatty liver at 50 and has no signs of that anymore. We have lost over 50 lbs and kept it off. Diet doctor is an excellent resource to look at because it interviews physicians who explain why it is good for allll of your body to be in ketosis. Intermittent fasting and keeping your blood sugar low has amazing effects on our cells. I just finished reading Grain Brain...excellent read that doesn’t push keto but explains the inflammatory effects that grain has on our brain health. I have been a weight watchers weigh in receptionist and have always been hungry!!! This is a lifestyle I will continue...I’m never hungry, my increasingly more common migraines are gone, my labs are all normal. Keto helps to decrease body inflammation and the aches and pains I thought were normal because I was almost 50 are history. My seasonal mucinex fix that would last for weeks in the spring and fall are history! Literally I have not been sick one day since eating keto. I believe that so many individuals are misinformed...the keto lifestyle has been nothing short of amazing for my husband and I.
I totally agree with Heidi. The study on which the conclusion that fat is bad is erroneous. My husband had a heart attack 7 months ago and being off work to recoup gave him lots of time to read about the fat vs carbs. He came to the same findings. Fat is good and sugar/carbs is not. He went on a low carb using the keto % ratio of fat, protein and carbs. He lost 35 pounds but more importantly he reduced the infflamation of his arteries which caused the attack. He is now reading about intermittent fasting. As he is the cook in our family I ate what he ate but not as diligent as him. Lost 15 pounds and the most important thing is I am easily keeping off the weight,something I struggle with all my life. Snack girl please do a lot more research before stating that keto is bad. It may be too drastic for some but we need to reduce our carb intake and eat full fat. "Don't blame the butter for what the bread did"
I was diagnosed as Type 2 diabetic 2 years ago. My triglycerides were over 1200 when I went in. I have been doing Keto for 3 weeks, I had to back off on the Metformin and Januvia because my glucose is 75-85. My doctor said Keto would kill me. I had an A1C done last Friday and good HDL is up and LDL is down. My Triglycerides are at 250 and probably lower now. Its not bad for you, it has helpled me, and my A1C is 5.7 which is normal. The drugs you have to take are worse than the foods for diabetes. Hubby had a blocked artery about 10 years ago and he started seriously eating a low fat diet which increased his carb intake tremendously and this past summer he was diagnosed with type 2 diabetes. Since then he has been eating low carbs and increasing fats and this week I started Atkins so I am essentially doing Keto. It's a complete change for me but I'm going to try. I'm going to stay in Phase 1 for at least a month, longer if I can to get a good start on losing weight. Just to clarify, I am not against eating full fat. I think avocados, olive oil, nuts, fish, - or your unsaturated fats are an important part of your diet. I also think that saturated fats such as in whole milk, full fat cheese, and beef are fine in moderation. It is the amount of saturated fat in this diet that concerns me. I have seen the keto diet work for my SIL. He was diagnosed with type 2 diabetes this past year. He lost 45 lbs. and improved on all of his blood work. 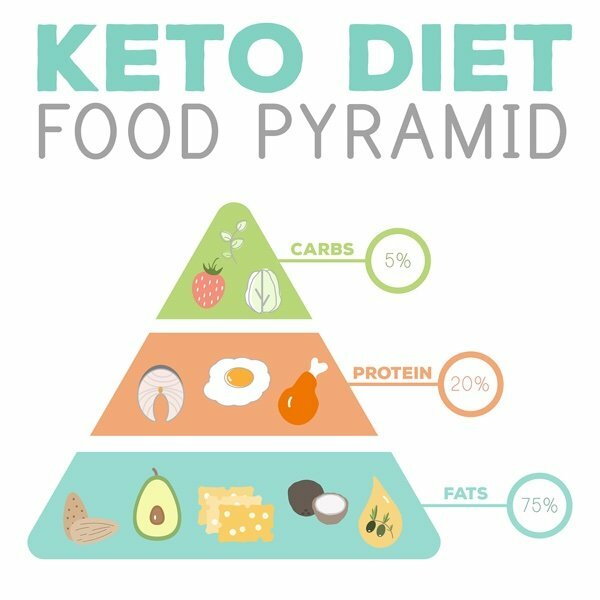 I have tried the keto diet but I felt miserable (headaches, depression, feeling tired all the time) the whole time on it. I also lost very little weight so maybe there are types of people that thrive very well on the diet and others that don't. I do believe drastically eliminating good fat is wrong. Yes, fat is high in calories, but it provides flavor, satiation, helps process nutrients from our food, and is good for our skin. One of my problems with WW was that if you wanted to eat good fats the point value was too high to do so. With all WW's "research" you would think they would come up with a better diet but they have remained steadfast on the low fat dogma. Enjoy real, unprocessed food with some good fat. You will be less likely to want to eat junk and you will be less likely to develop diabetes. I would suggest you watch the movie "What the Health." I was able to check it out from my library. The findings, all backed up by research with links to the studies on its website, shocked me. It would not support the Keto diet due to the saturated fat but it shows how the diet recommended by the American Heart Association, the American Diabetes Association, and other well-regarded associations are also unhealthy because their sponsors are the very Industries whose foods make us sick. I see a lot of people trying Keto. Don't think it is for me, especially being a vegetarian. I do try to limit my grains, but I eat a lot of fruit and sugar. The Canadian Food Guide was recently updated. They no longer have the food groups and focuses on half the plate being fruit and veggies, a quarter being protein, and a quarter being carbs. They recommend not eating a lot of saturated fats as well. There is a stronger focus on plant-based proteins. To me, this seems like a better way of eating. For the first time, there was little to no talking to the industries, so they couldn't buy their way into the food guide. Also, I really like how they talk about it's not just about what you eat, but how you eat. I don't think they would recommend the Keto diet. I have been listening to Real Food Keto by Jimmy and Christine Moore. They have a section that goes very in depth on the topic of fats, good ones, bad ones, and why certain amounts of each kind are important. I have also listened to Keto-Adapted by Maria Emmerich, Grain Brain by David Perlmutter, Keto Clarity by Jimmy Moore, The Obesity Code by Dr. Jason Fung, The Complete Guide to Fasting by Jimmy Moore and Dr. Jason Fung, and started listening to The Big Fat Surprise by Nina Teicholz. I also have been following several podcasts on the topic for about 10 months as well as digging through every website I can scrape up. I can't get enough. I am so intrigued. I have heard and read all kinds of things, but the general consensus is that saturated fats are not bad and do not need to be avoided, although, you want to make sure you're including poly and monounsaturated fats as well. The mainstream idea that the keto diet is all about bunless bacon cheeseburgers and tablespoons of butter in your coffee is a very overgeneralized and poor example of what the ketogenic diet really is and the benefits, when applied properly, are exponential and go way beyond weight loss. Please consider doing some more research on the topic. It is incredibly interesting to learn about the biology and mechanisms that really make this way of eating a path to optimal health. A really fine body of scientific research is available at nutritionfacts.org. There is also a group of dedicated doctors, both medical and research, that are dedicating their lives to publicizing research data that have been known for decades, and that promote healthy long lives. [Drs Barnard, Esselstyne, Greger, Fuhrman, McDougal, etc.] . I find their science to be the most compelling and credible. This is a very important topic, Lisa, thank you. Thank you for writing this! My concern about Keto is also the Keto drinks (powder to make drinks) that is being sold. These products are being promoted as weight loss without making any lifestyle changes. So it's magic dust! In all seriousness this powder is supposed to put the body into ketosis all on its own. It's supposed to also give you more energy etc. I think folks on the powder do also follow the Keto diet but really it's all about the special drinks. Can you or any of the other readers speak to this? One thing I also read is that people are not supposed to take this special powder if they are on particular medications (mostly anti depressants). So the powder clearly does something to interfere with how particular medicines work (brain chemicals--yikes). I read Eat Fat, Get Thin by Dr. Hyman who has multiple studies backing up his claims. I then got a call from an old friend who is a retired doctor. She wanted to let me know that in her opinion the medical profession was wrong in scaring people away from fats and she regrets the mistakes she made in so counseling patients over the years. My neighbor was diagnosed with diabetes and he decided to take 3 months and try to alter the course of the disease. He adopted the principles of the Keto diet and three months later had normal bloodwork. The doctors were amazed. For myself, I am healthy, on no meds, and I have adapted the diet for what works for me. Sprouted breads, nuts, seeds, almond butter, grass fed butter and beef, lots of farm eggs, chickens and veggies. Moderation works for me. People are waking up to the fact that the medical profession is in bed with Big Pharma, FDA and others. You just have to follow the money. I no longer trust them. Do you own homework. In response to Leah G. about keto drinks. There are many ways people choose to eat keto. Personally, I avoid processed food at all costs because of all the chemicals they put in products to give them shelf life. This act in itself really lowers the carbs I eat. I don’t like using any sweeteners. I find that when I learned about all the problems with inflammation it made it easier to feed my body the healthiest instead of looking at what I “couldn’t” eat. I look at keto as eating whole food, healthy fats and as little as possible added chemicals. I don’t want more vices or products, I want clean. Susan Eadie is right. BTW, epilepsy is a neurological disorder not a disease. I had a cousin and sister in law with epilepsy and this diet might have helped them. Nutrients are not a problem either if you are eating plenty of veg and whole eggs which are full of nutrients. This is a great food plan for diabetics. Full fat satisfies the appetite better and you generally eat less too. Just because it was originally intended for people with epilepsy doesn't mean that it doesn't help with other health issues. At 68 my labs are like that of a 40 year old says my doctor. There are four kinds of keto plans, I suggest you check out the specifics of each to see what is right for you. I have not tried the Keto diet and I'm not going to slam it; just give my opinion. Based on what I've seen, is that it doesn't seem like a good option. My two step-sisters went on it and each lost a little over 100 pounds in five months. They got sick of doing it and stopped. One of them gained back 60 pounds in a month and a half. She now weighs more than before she started it. The other step-sister gained the weight back more slowly, but it still only took about four months to gain it ALL back. It's a diet that I personally couldn't do for the rest of my life and from what I've seen (I also know three other people who had success on the diet and then stopped and gained it all back quickly), once you start eating the carbs again, the weight comes back. I am currently doing WW and it works for me. The weight comes off slower, but I know that I'm not really limiting myself to what I can eat - I just eat less of things that are considered "bad" for you. Everyone is different and you need to do what works for you. I just want everyone to be careful with whatever they are doing - use common sense and listen to your body. Keto does not specifically call for an increase in saturated fat. However, it doesn't discourage it either. And the research on saturated fat remains muddled. Most serious Keto advocates still lean heavily on non-processed plant based fats. As for the nutritional benefits of grains, I haven't seen much of anything that gives substance to discouraging grain free eating. Plant based foods seem more than sufficient to make up for any upsides from incorporating whole grains. Finally, anyone who is constipated on Keto simply isn't doing it right. Even though the carb count is low, it's net carbs. One should still have have good portions of leafy / green vegetables and other high fiber low sugar foods (cauliflower, mushrooms, olives, etc.) as a fair sized part of daily meals. Other than animal fats, the thing that's wrapped into Keto which is likely the most controversial is Bulletproof coffee. The research on that as a regular dietary component is immature at best. It's mostly speculative. It is enjoyable though. I CANNOT eat flour . . . it is like poison to me, my mental state is altered, I feel sick, my hands and feet swell no energy. I feel FANTASTIC on Keto both mentally and physically. If I eat just one piece of bread, back I go into the abyss. Keto is my lifesaver. I have a bullet-proof coffee every day and within a week I could see the difference in my skin . .Keto is like a rejuvenation from the inside out. Every day for over 30 years I drink the juice of one lemon, I tried Keto the first time in 1978 and it was like a miracle. Not every body is the same and some people just cannot do it, but for me and many otheres, it is the best way to eat. For those people who regain the weight, they need to do some of the work too. You can't completely rely on what you *think* is the proper way to eat. We all have bad habits to overcome. It really takes determination. Eating fewer calories than before is hard but that is why I eat a lot of green salads and soups. They are filling an you never feel deprived. To tell someone they can't have something is like telling them not to break the 10 Commandments. The more they are restricted the more they will possibly fail. I eat everything I want but less of it. All you need to do is look at history and long term studies. Keto is a dangerous fad that lines your arteries. Keto seems to work for many of my clients and friends in the short term...not for me though. I believe for some body types, and people who have diets high in low-quality calories to begin with, can see dramatic effects with a high-fat, low-carb diet. People with a lot of weight to lose or with serious health problems or chronic conditions all seem to benefit. For the person with a relatively healthful diet who'd like to lose a little weight though - I have not seen anyone get good results, and I don't think it's good for a healthy body to shock itself that way. Like with many diets, I believe it is as much as about what you are no longer eating, as what you suddenly ARE eating. Look at all the wholesome foods recommended for a keto/HFLC plan - avocado, nuts, olives and olive oil, meats, fish, non-starchy vegetables, full fat yogurt and cheese...nowhere in there are Lean Cuisines, protein shakes, fast food, boxed or frozen convenience meals/meal kits, corn-syrup-laded jarred sauces, or other of the myriad empty calories that the Standard American Diet relies on. I've tried almost every way of eating out there, out of curiosity as well as so I can understand how to meal plan for my clients...this one makes me feel ill. So be it. For those getting good results, more power to you! I don't know how it will impact you in the long run, but in the short term, reversing illness and dramatic weight loss for those who need it seems like a good outcome.